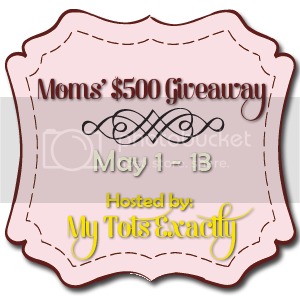 I am a mom, and together with 49 other blogs mostly authored by mom bloggers, we're giving everyone a chance to win a total prize of $500. For us MOMS, this is our way of giving back. Below are the blogs of the fabulous moms who've teamed with me for this grand giveaway. Feel free to visit their blogs for other giveaways and deals, parenting insights or just drop by and say Hello. My Tots Exactly| Fabulicious Diva | Pinay Mommy Online | Proud Mommy of Three | WAHMaholic | Nshima Servings | Pinay Mama | Pinoy M.D. | The Journalistic View | Mom's Best Deals | Diva Fabulosa | Happy Home and Family | Foodies Galore | Free Travels and Tours | Topics on Earth | Fashion and Travel Siren | Hobby Lovey | Mom's Ups and Down's | Living a Diabetic Life | Pinay Ads | Tinkerputt's Turf | Everything Nice | The Misis Chronicles | Pinay Mom In Germany | Experience of a Super Mommy | Nita's Random Thoughts | Some Things Are Free | Zowanderer | Make or Break | Hearts Content of a Mama | Earn Money, Save Money | Trips and Travels | The Camera Bug | Pop Ups of My Mind | Work at home Mom | Healthful Choice | Written by Mys | Momsicle Online | Twenteen Mom | Momma Helps | Shop Vintage Clothing | I love Hues | Tottering Mama | Whims and Views | Coffee on the side | Samu't Sari | My Kids in Germany | The 24-hour Mommy | Mom Shares | CDO Mom |On the first entry, please don't forget to put THE 24 HOUR MOMMY as the blog you're entering on. The giveaway is open WORLDWIDE to anyone with a Paypal account by the time the winner is declared. It will be open from May 1, 2012 at 12:01 am EDT to May 13th, 2012 at 11:59pm EDT. There is no purchase required to join this giveaway and you should be 18 or older to join. The giveaway is in no way sponsored or affiliated with Facebook or Twitter and all data gathered will be kept confidential by the host and sponsors. The host reserves the right to remove/delete any fraudulent entries if found. So go on ahead and enter through the Rafflecopter form below, and on behalf of the host and all the sponsors, Happy Mother's Day to you (or your wife/mom). I would just like to have a fun day with the boys together with both of my moms (my mom and my mom-in-law) this Mother's Day. Good luck to everyone joining through The 24-Hour Mommy! I would love to spend some time with my children on Mother's Day, but that is simply not possible as they all live in different states, so a phone call would be the best gift I could receive from any of them. I would like to give my mom a nice handbag! If I couldn, I would really like a Kitchen Aid Mixer for Mother's Day, but that simply isn't in the budget right now.